You hear them all the time, but mostly they slip under the radar. Environmental sounds are the background 'atmosphere' that pervades spaceships, control rooms, power stations, busy offices, streets, and everywhere else. The classic 'bridge sound' from the original Star Trek is a perfect example: if you hear a few seconds of it you know exactly what it is, and yet most of the time you aren't are of it. Like a lot of audio that underpins moving pictures, your eyes are distracted, and the sound plays a strong supporting role. But remove the sound, and suddenly the pictures aren't as compelling or interesting. Music uses background sounds too. On stage, the atmosphere built up by the right sound gradually rising from subliminal to noticeable can make the reveal of the musicians all the more an event. Staging isn't just lights... And during a set, the right background sounds can control mood as well as provide links between songs. Crafting atmospheric sounds requires a lot of knowledge about the way that sounds work on people. It also eats up source material, which is why making background sounds is a challenge, and it explains why some of the most popular plug-in downloads aren't what you might expect. 'Sound Generators' are a key part of the tools that creators use, along with the audio editing software and sound effects library that you were probably expecting. Granular synthesis is very popular at the moment, and there are a lot of software instruments that are devoted to producing sounds using little fragments of sound. But creating frozen spectrum grabs is only part of the solution, mainly because freezing a sound produces a static spectrum, and that quickly gets boring. Just as movement makes movies engaging, evolution makes sounds interesting. Recently, I've been looking at various ways of capturing spectral fragments, and I've struggled to turn them into something that I can use. 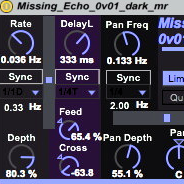 So, my latest Max For Live plug-in for Ableton Live is specially designed to turn audio fragments into atmospheric background sounds. It is a sound generator based on grains instead of the longer samples (or FM or feedback algorithms) that are often used. 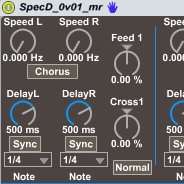 gFreez_mr allows the capture and playback of four separate grains of frozen spectra, and then uses a four-phase LFO and LFO-controlled panning to animate those four components into a constantly shifting atmospheric sound. 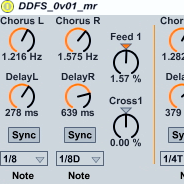 gFreez_mr is particularly good for synthetic, electronic sounds, and it has a number of functions that are specifically designed for live use. Note that since we have now captured all of the four slots, then the 'Input/Mute' button on the far right has been set to 'Mute' so that we will no longer hear any audio from the sample player. The small row of buttons in the centre of the four slots affect all of the slots, and so clicking in the 'Mute' column will set all of the slots to muted, and so no audio will be heard at the output. You can also just click on the slot control button if you wish. This sets gFreez_mr playing all of the slots, an you will se the four volume indicators in the centre right moving back and forth. The larger the block, the louder the volume, and the LFO has four phases, so each slot fades in and out in order. The 'Fade Time' rotary control sets the rate of the LFO, and because the actual time for a complete cycle is important in this type of sound generator, then the time for a cycle is indicated in large numbers - '34 seconds' in the screenshots here. 1. Wait for the volume block in your chosen slot to drop to zero, then 'Mute' that slot. You can now 'Grab' a new spectrum, although you won't be able to hear it because the 'Input/Mute' button will be set to 'Mute' to prevent this. (You can always set the 'Input/Mute' switch to 'Input' so you can hear it, but your audience will hear it too!) I tend to go by the spectrum display when I'm doing this live updating, and you should quickly get the hang of assessing kind of what a grain will sound like based on the spectrum. 3. Wait for the volume block for that slot to get to zero again, and quickly click on the 'LFO' button. The new slot will then be included in the new cycle. This process isn't as tricky as it might sound, and it enables much longer sounds to be generated live. Remember that gFreez_mr does not capture samples - it captures the spectrum of a very short piece of audio: a grain. So the sound that you hear from each slot is that spectrum turned back into sound - a very simple resynthesis process. This type of sound generation has limitations, and there is a distinctive character to the sounds, but there is a pretty wide variation of timbres, and mixing in real samples can provide additional variation in an audio editor. This first version of gFreez_mr does not save the spectral grains, and so it is intended for live use. Future versions may add additional functionality, of course. Anyway, have fun with this first version, available as usual from MaxForLive.com. 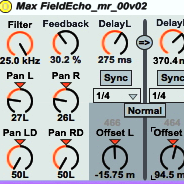 Here is a summary of my latest free MaxForLive 'Echo' effects. As usual, these are all available from MaxForLive.com via the 'Download' buttons in each of the boxes below. This echo puts an LFO inside the feedback loop, so the number of echoes changes over time. This two-stage echo enables you to place echoes in the stereo image: a very 'musical' echo. 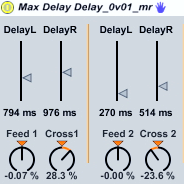 Delay Delay is a simple echo with two sections. This is the most basic of my echoes, and my first! SpecD is a stereo dual-stage pitch-shift/chorus echo, and the 'dark' version of the DDFS echo. This echo adds frequency shifting inside the feedback loop, hence: Delay Delay Frequency Shift. This echo provides echo times controlled by random noise... Not your ordinary echo effect at all! This echo provides auto-panning of the echo outputs, and so livens up the stereo image. 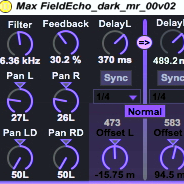 These echo effects provide a snapshot of my MaxForLive programming: Delay Delay Echo is a very early 'learning' project, DDFS adds frequency shifting, and SpecD is an experiment to see if 'dark' effects are more popular (and if using something reminiscent of a 1970s Japan naming scheme makes the effect more appealing!). 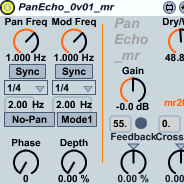 Pan Echo starts to explore what you can do with auto-panning of echoes, whilst Field Echo explores static stereo fields. 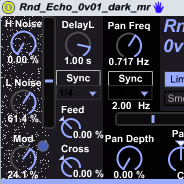 Note that whilst there are four 'dark' and four 'ordinary' effects here, both colour variants are not always available - Rnd Echo and Missing Echo are only available in 'dark'.